Another one of the bedrooms at Mount Stuart had a large bed surmounted by this amazing display of marital heraldry. The most notable part of this display is, of course, the marital achievement of arms hanging at the head of the bed. 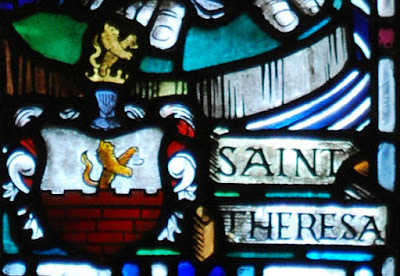 They are the marshalled arms of John Patrick Crichton-Stuart, 3rd Marquess of Bute (bearing Quarterly: 1 and 4, Or a fess checky azure and argent within a double tressure flory counter-flory gules (Stuart); 2 and 3, Argent a lion rampant azure (Crichton), impaled by the arms of his wife, Gwendolen Mary Anne FitzAlan-Howard, eldest daughter of Edward George Fitzalan-Howard, 1st Lord Howard of Glossop (the second son of the 13th Duke of Norfolk), Quarterly: 1 and 4, Gules a bend between six crosses crosslet fitchy argent, as an augmentation on the bend an escutcheon or charged with a demi-lion rampant pierced through the mouth by an arrow all within a double tressure flory counter-flory gules (Howard); 2 and 3, Gules a lion rampant or (Fitzalan). 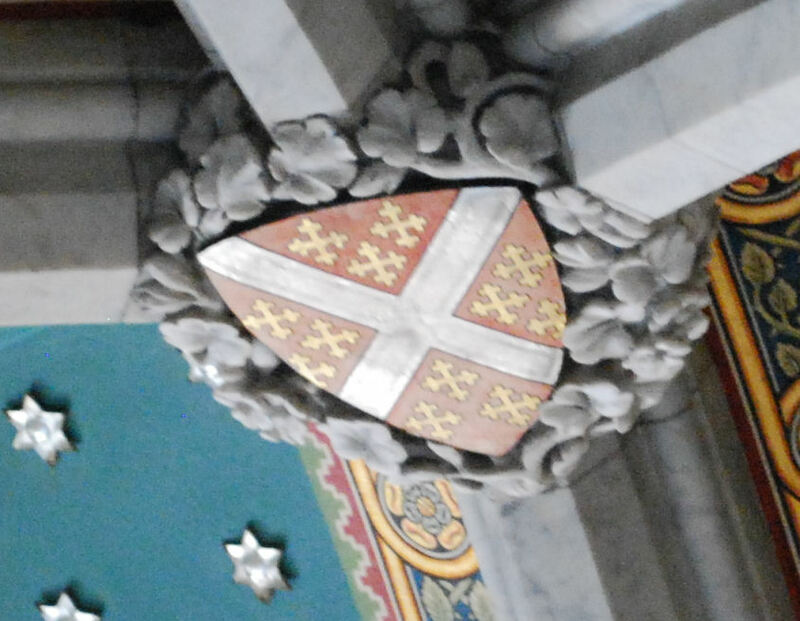 The external ornaments of the shield (crests, supporters, coronet, collar of the Order of the Thistle) are all those from the husband's family. Three of the crests we have noted a number of times elsewhere in Mount Stuart as those of Stuart (the red demi-lion), Crichton (the wyvern breathing flames), and Herbert (the green wyvern holding a red hand in its mouth). The arms are, from left to right, those of: Crichton; Stuart; the marshaled arms of Stuart and Howard; Howard; and FitzAlan. 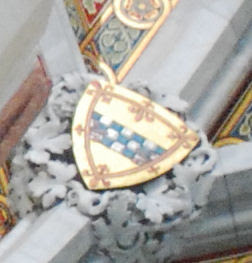 The narrow band above the shields is a repeating heraldic motif, Or a bar gemel flory counter-flory gules (modified from the double tressure of the shield), and A fess checky azure and argent (the checky fess of Stuart). That's a lot of heraldic display for a bed! I'm not sure how comfortable I'd be sleeping in a bed like that. Although, I supposed that it's something that I could get used to. I'll have to talk to my wife to see how willing she would be to embroider an achievement of my arms to go up over the head of our bed. I'm sure she'd be fine with it, right? A verdict has finally been reached in a court case in Belgium where master woodcarver Patrick Damiaens had sued store chain Zara Home for breach of copyright, when the chain began selling candles with a design which he said had been stolen from him. Zara Home claimed that the similarity was a coincidence (though they did pull the candles from sale). Take a look and see if you think that the similarity was "a coincidence" or not. The Zara Home candle is on the left; Mr. Damiaens' carving is on the right. Yeah, the court didn't buy that argument, either, and ordered Zara Home to pay damages and legal costs, and to publish the decision in Heraldisch Tijdshrift, a Dutch magazine focused on heraldic art. And no, I don't mean anything like, for example, the Royal Arms which appear in the courtrooms of Great Britain or Canada. 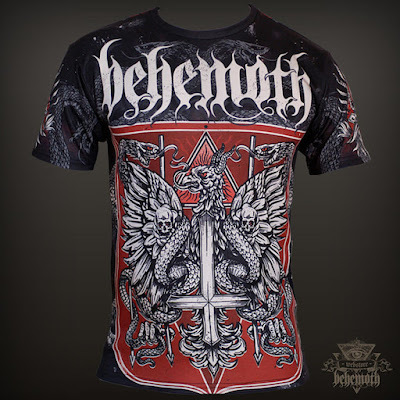 No, this was a court case in Poland, where the frontman for the rock band Behemoth, Adam "Nergal" Darski, and Maciej G., the band's webmaster, along with Rafal Wechterowicz, the graphic artist, had been charged by the District Prosecutor's Office in Gdansk for "insulting" the national coat of arms of Poland on the band's "Republic of the Unfaithful" tour artwork and merchandise. As you can see, it's pretty clearly evocative of the national arms, enough so that an heraldic expert consulted by the prosecutor's office said that the tour's artwork featured "a distorted image of Poland's national emblem," and that it "included elements and symbols considered Satanist and anti-Christian, with the aim of conveying content far removed from the historical and state ideology." 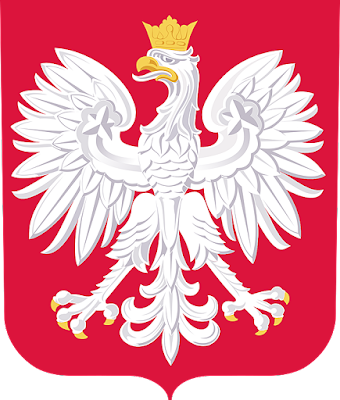 Polish law protects Polish symbols against public profanation and insult, and any public use may be considered a criminal offense, the conviction of which could result in up to a year in jail. Someone clearly thought that this artwork was both profane and insulting. But an April 16, 2018 story notes that the charges against all three defendants have now been dismissed before the case went to trial, and Nergal has said on Instagram that the design "will soon be back in stock" in the band's webstore. Just to prove to you that not every display of heraldry at Mount Stuart has to be over the top and "in your face," on the exterior of the house on one of the upper floors, we ran across a couple of lightly heraldic, utilitarian articles. Both were based on the checky fess of the Stuart coat of arms. The first was a support bracket for a rain downspout, about as utilitarian a thing as I can think of. 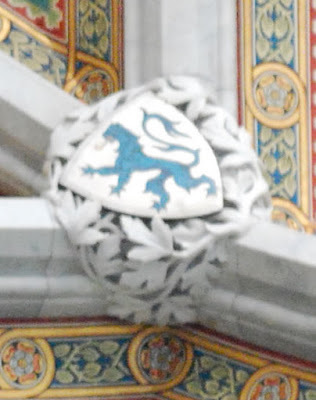 And yet, what a nice way to incorporate a major element from the family's coat of arms. The other workaday item bearing the checky fess was a couple of sill plates outside of a window. Ordinary, everyday items all, but demonstrating other ways that heraldry can be used to "spruce up" even the most mundane of objects. I am assuming that this is actually someone's birth star chart, showing the locations of many of the stars, the sun, the moon (and its phase), and the planets on his natal day. And as you can see in this close-up of the central arms, the whole thing is done in exquisite detail. These are, of course, the arms of Stuart (Or a fess checky azure and argent within a double tressure flory counter-flory gules) surmounted by the coronet of a marquess, the whole surrounded by an extremely well-done oak wreath. Just the sort of thing you need to say to everyone who sees it, "Yes, this is me on my natal day." and also to add, whether you say it in Mel Brooks's voice from his movie History of the World, Part I or not, "It's good to be the Marquess."